Iranian state TV on Friday ran a documentary featuring a computerized video of Iran’s drones and missiles bombing Tel Aviv, Haifa, Ben Gurion Airport and the Dimona nuclear reactor in a hypothetical retaliation for an Israeli or American strike on the Islamic Republic. “And America, its regional puppets and its guard dog – the Zionist regime – should know that the response of the Iranian nation to any kind of aggression, attacks or even threats will be a response that will make them collapse from within,” the film shows him saying. 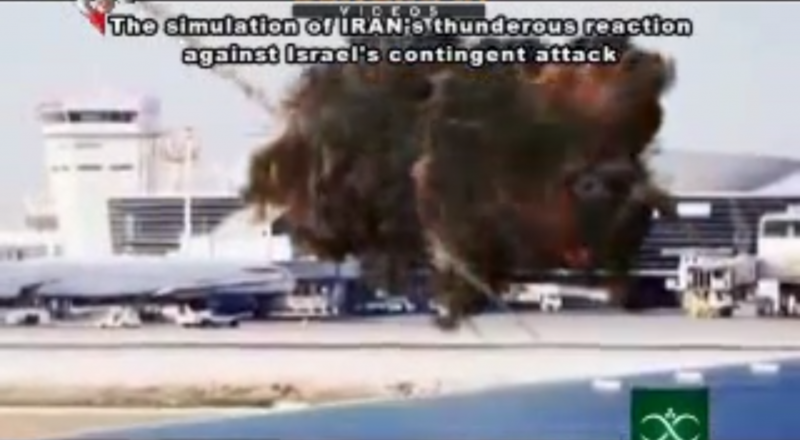 Set to dramatic music, the video shows Iranian drones and missiles carrying out strikes against Tel Aviv’s Kikar Hamedina square, the Azrieli Towers skyscrapers, and the IDF’s Kirya central command complex, as well as Ben Gurion International Airport, Haifa’s Technion, several army and air force bases, and the nuclear reactor in Dimona. The strike on the Israel’s central command building is shown taking place while former prime minister Ehud Olmert and former defense minister Amir Peretz — who served in that capacity during the 2006 Second Lebanon War — are inside convening a meeting. The clips of drone strikes on Israel are interspersed with shots of Israeli emergency personnel evacuating injured Israeli civilians and soldiers while air raid sirens wail. A barrage of missiles brings down Tel Aviv’s skyscrapers in a final blow. Afterwards, Iranian drones and missiles are show attacking the American aircraft carrier USS Abraham Lincoln on its way through the Strait of Hormuz into the Persian Gulf. Iranian drones are shown downing several American aircraft before sinking the US capital ship. Zooming out to a map of the Middle East marked with US military bases, Iranian missiles are then shown striking American military targets across the Persian Gulf. 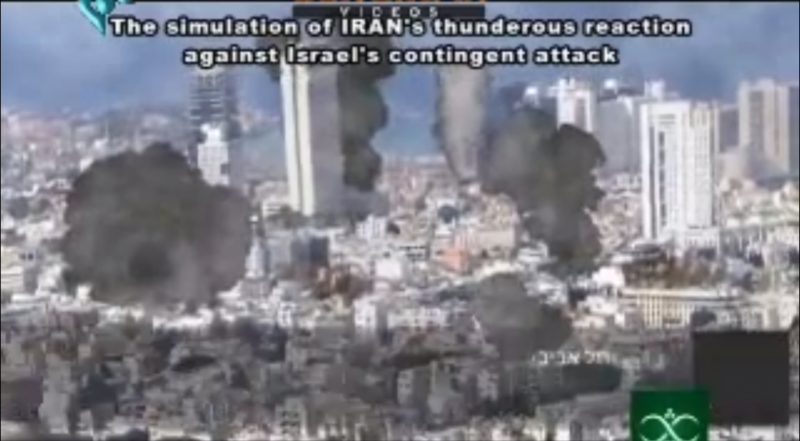 In November, Iranian state television aired a shorter animated clip showing Iranian missiles targeting Israeli cities. Iranian leaders have made repeated threats to wipe Israel off the map, and have threatened to annihilate Tel Aviv should Iran’s nuclear facilities be attacked by the West.